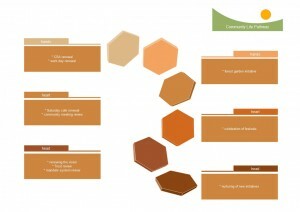 In the analysis, I applied Holmgren’s design principles to create general principles for community design work. These together with the permaculture ethics and the emphasis on earth care, you have a set of design tools for community life. Reconnection with nature, the immediate environment and nature’s cycles is essential to create people systems that are dynamic, resilient and adaptive to change, as well as ensure that earth care is being practised. The pathway is based on exploring what is living in the community in collaboration with others after personal and group reflection on what is going well and what is challenging in community life, as well as our visions for community life and our plans on how to engage in community life. All work had to be done collaboratively. As the founding impulse was based on Steiner’s work, there is rich ground here for exploring anthroposophy and its approach to earth care, people care and fair shares in biodynamics, creative and curative education and community life as well as the mandate system. The analysis of opportunities for earth care, people care and fair shares showed what is and the potential at Hoathly Hill. Looking at the life phase of the community, Hoathly Hill has, in the forty years since its inception, developed sophisticated systems on all levels. There was a definite need for review at all levels – the vision, the social life and the work processes – and this was felt by most members, old and new. Recently there had been quite an influx of new families and the community was not being gracious in transition. Looking at the model for the phases of an initiative, a renewal of aims, values, culture and commitment was needed. This meant there had to be a commitment to reviewing and learning. A transparency of and responsibility for all processes and tasks was needed to create a participatory community valuing everyone’s contribution. I decided to work holistically with the head, heart and hands of the community (fair share, people care and earth care, if you like) first reviewing on these levels and then creating a supportive environment for initiative taking. After the analysis tool of applying the principles to generate design ideas brought up many, many great design projects, I decided to work from pattern to detail as well as least change for the greatest effect and focus on reviewing community systems and creating the conditions for community initiatives to flourish. This links with other diploma projects, ie forest garden pathway and community initiative pathway.